On my recent visit back to the North End I just had to go to I AM Books in North Square and buy a copy of Jane Healey’s book, “The Saturday Evening Girls Club.” Based on actual facts it is a fictionalized account of four young immigrant women living in the North End in the early 1900s. The Saturday Evening Girls Club was founded by librarian Edith Guerrier and artist Edith Brown as a forum to bring art and literature and music to the young women of the North End. Their benefactor was Helen Storrow. While I was reading the novel, I felt as if I was transported back in time. Even though I grew up in the North End in the 1950s, I could identify with these women because we shared some of the same experiences. I followed Caprice Russo and her friends, Ada, Thea, and Maria as they walked on Hanover Street, Charter Street and Hull Street. I followed them to the butcher shop on Salem Street and the bakery shop. I followed them to their walk-up apartments for Sunday family dinners. Ms. Healey is so adept at describing the sounds, the sights and the smells of the North End that it was easy to recall my experiences when I lived there. I remember going shopping with my maternal grandmother, Anna, on Saturday mornings. We would go to the butcher shop where she would pick out a fresh chicken and I would watch in amazement while the butcher in his rubber apron and boots would decapitate and pluck the chicken in front of us. All these years later I can still hear the squawking of the chickens in my head. Then we were off to the bakery shop in the shadow of the Old North Church on Unity Street where we would buy fresh scali bread from Josie. On Sundays at our big family dinners we would have home-made ravioli and gravy simmering on the stove with meatballs, sausage and braciola. The bread was perfect for dunking in the gravy as it bubbled. I was with Caprice and her friends at The North Bennet Industrial School and the North End library, too. As part of The Saturday Evening Girls Club, they discussed literature and listened to music and performed in plays. One time they performed for Mrs. Jack Gardner and other prominent ladies of Boston society at the Isabella Stewart Gardner Museum. My friends and I would also spend hours after school at the North Bennet Industrial School. We learned how to cook and sew and put on plays. We modeled the skirts we made at a fashion show and we performed our plays for our parents at the school. I remember one play, “KerChoo”, in which I had the part of Choo, one half of a sneeze. It was a far cry from “The Merchant of Venice” that Caprice and her girlfriends were privileged to perform for Mrs. Gardner. I followed the Saturday evening girls up to the roof, too. This was where they would meet to talk, to laugh, to cry. They would come together as friends to share their lives. My friends and I would also go up to the roof to hang out. 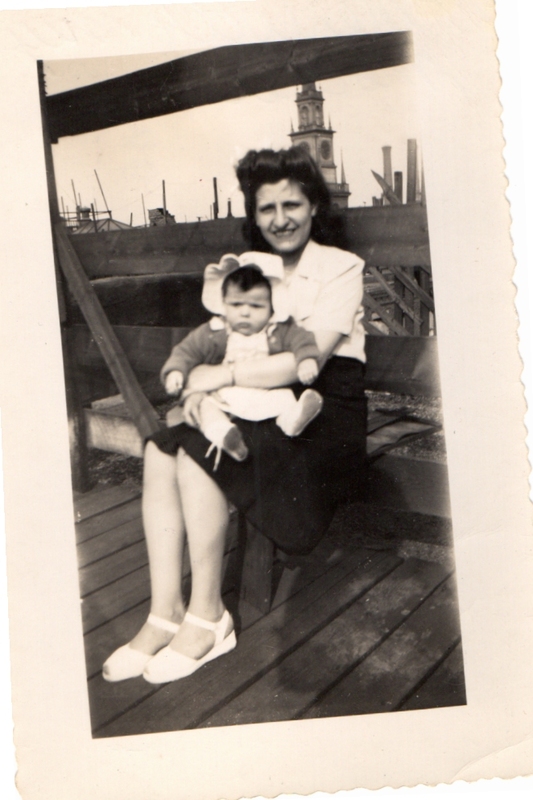 My grandmother Nini’s building did not have a rooftop deck or fancy patio furniture. 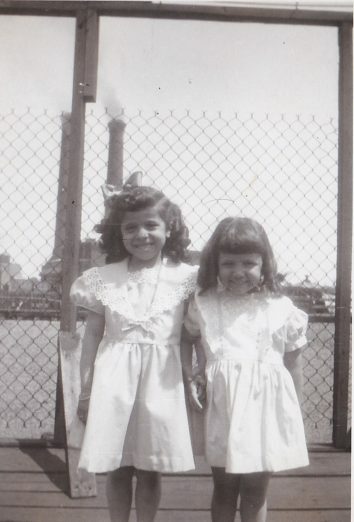 We would sit on orange crates or on the wooden floor under the clotheslines where my mother had hung our laundry to dry. The roof was also where my parents took many pictures of me and my younger sister, Angela, when we were little kids. What could be better than a view overlooking Boston from the rooftop! Read more from Natalie Romano. NorthEndWaterfront.com welcomes commentaries via email to info@northendwaterfront.com or through our Submit a Post online form. Remember Josie’s bakery as well as Anna’s on charter St.
GREAT MEMORIES THAT CAN NEVER BE DUPLICATED OR TAKEN FROM US. Natalie. Thank you for this nostalgic article. You made my mouth water when you mentioned those home made raviolis. I remember my grandmother Sacco drying them on a white sheet on the bed. I also went to the North Bennett School. We put on plays as well. Our teachers were students from the local colleges. Nice memories! Once again I am reminded how lucky we were to have lived in the North End during our formative years. My sister, Natalie, has a special talent for describing her memories and taking me back in time with her. I look forward to another of her articles.